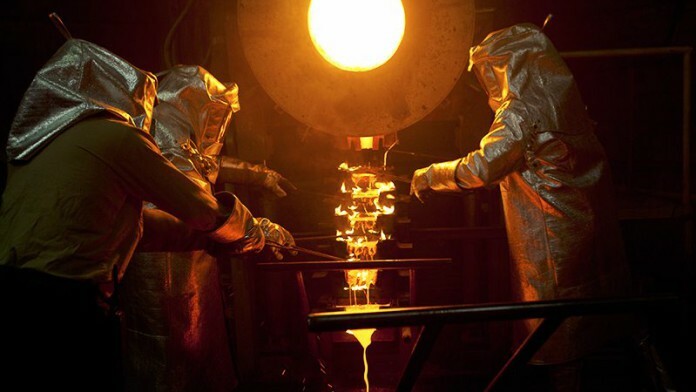 SIBANYE-Stillwater extended its debt-reduction programme by $125m (R1.75bn) after agreeing with Citibank to sell forward 105,906 ounces of gold in the fourth quarter of its 2019 financial year – a development that takes total de-leveraging this week to R3.45bn. “The gold pre-payment, in addition to the share placing announced earlier this week, are both strategic and pre-emptive levers to enhance our balance sheet flexibility and ensure that the group is appropriately positioned and sufficiently robust to endure any exogenous challenges,” said Neal Froneman, CEO of Sibanye-Stillwater in an announcement. Shares in the company shed 1.36% on the Johannesburg Stock Exchange at the time of writing taking total losses for the last two days to nearly 20%. The stock was down heavily on April 10 after unveiling a share placement in which it raised R1.7bn. Today’s announcement sees the company sell gold at a floor price of $1,200 per ounce and at a cap of $1,323/oz. Proceeds from the gold sale will be put towards repayment of the firm’s revolving credit facilities. Sibanye-Stillwater will have R10bn in undrawn facilities. The company last year raised $500m by selling metals in a streaming transaction of which $400m was used to lower debt. The decision to make further in-roads to its debt, which on a net debt to EBITDA level as 2.5x, was down to the impact of a four-month strike at its gold mines by the Association of Mineworkers & Construction Union (AMCU). The debt reduction was also to position the group against potential hazards created by wage negotiations with AMCU (and other unions) in respect of a new wage agreement at its platinum group metal (PGM) mines. Froneman’s relationship with AMCU president, Joseph Mathunjwa, couldn’t be lower after the union boss at a recent PGM investment conference first decried the notion he was locked in a personal battle with the gold and platinum executive only to characterise him as a modern-day John Cecil Rhodes, the famed colonialist and imperialist. At some 104,000 ounces for the quarter, gold production was 90% of anticipated production levels, but only 36% the level of production of the first quarter in the previous financial year. “Unit operating and all-in sustaining costs will be negatively impacted by the reduced production levels,” Sibanye-Stillwater said. Sibanye-Stillwater also said earlier this week that its Stillwater in the US got off to a slower than anticipated start to the financial year which compounded its financial challenges. Stillwater’s production guidance was unchanged, however. Goldspeculator , we are waiting for your analysis on Sibanye deals ? This company has been subject to an asymmetrical, number of negative events. Last year In South Africa, various “seismic events” lead to fatalities, production halts and the corresponding negative view on the share. Then, the enormous tax surprise at Stillwater in the USA just as that operation came on stream. Now, the unbelievably long strike at the other half of the operation in South Africa which is clearly a loss for both the employees and the company with a defiant union leader standing strong (even with the potential loss of support based on his stance). These events appear to be very circumstantial when taken in isolation. However, as with the fruit of the tree, the collective result of these occurrences has forced the management to do the logical thing and hunker down on cash. Achieving this through share dilution (to the detriment of shareholders) and forward sales/hedging and effectively coaxing the company to sell a large part of its 2019 production at a capped price (to the detriment of the company). What is notable is that Citibank have ridden to the rescue to save the company from its revolving credit facility, by taking 25% of its annual production (in the last quarter) at a capped price of $1323.